It’s an easy trap. Prevention is a cherished goal for childhood obesity. Behavioral economics has such a strong cachet that it just earned Richard Thaler a Nobel Prize. So when elegant research that says little nudges – like a sticker on a piece of fruit – can lead children to make better food choices, we want to believe it. Is it too good to be true? Maybe or maybe not. But a painful process of a stepwise retraction is calling some very visible research on this subject into question. A Cookie or an Apple? JAMA Pediatrics published a now retracted study in 2012 and it got plenty of press. Elementary school children between the ages 8-11 could choose an apple or a cookie to go with their lunch. 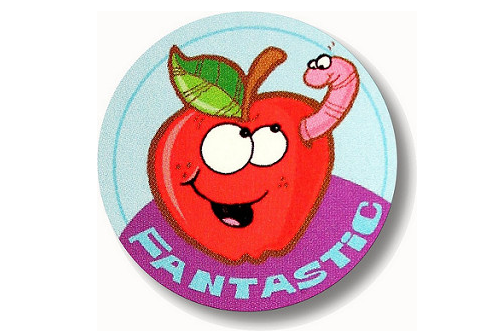 The study showed that simply branding an apple with a cute little Elmo sticker led more children to choose an apple. It sounds simple and believable, right? Well, as Aaron Carroll explains in the New York Times, such research is anything but simple. You have to deal with IRB approvals. You have to be careful and thorough in your methods. Your data collection and analysis requires rigorous care. And that didn’t happen with this study. So the authors retracted and replaced the original publication a few weeks ago. And then on Friday, they fully retracted it after more problems surfaced. People crave magical narratives – especially when facing difficult challenges. Escapist fiction is a great way to relieve the stress of work and life problems. But that desire bleeds into our thinking about childhood obesity all too often. So, when headlines told us that childhood obesity was plummeting, we wanted it to be true. Naysayers are annoying. But they turned out to be right. We have a serious problem with a lapse in critical thinking about childhood obesity. It goes deeper than just a few flawed studies. Assumptions that drive those studies need critical evaluation, too. Selling more fruits and vegetables is not good enough. Driving down soda sales is not good enough, either. We need policies that will actually have an impact on obesity rates. People who tell you that they have those policies in hand might be prophets. Or they might be selling you a prevention story that’s too good to be true. Click here for the now retracted study, here for the first retraction and replacement, and here for the full retraction. For more on this saga, click here and here. Long live critical thinking. The children need and deserve all the help they can get.